Trees make me happy. 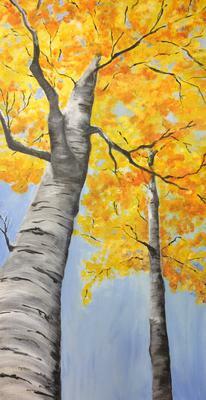 I painted these birches almost a year ago, and a good friend asked if she could have it. Of course, I gave it away, thrilled that someone wanted it. Around New Year's this year another friend texted that 'if I ever painted that one again, she'd buy it and hang it on her wall"! I'm about to start the new one, and I also have now pursued making prints from my canvases. Who knows??? Isn't it wonderful when we get applause and our work touches others? This is a lovely piece, and I wish you luck in your future endeavors.